Meet Umberto, the strongest man of Donaustadt! Servus, hello and welcome to Our Creative Corner! Today I am not only excited because I want you to meet Umberto, who is the strongest man of Donaustadt (which is the district I live in in Vienna), but also because this is my first post as the Resident Guest Designer of OCC, working alongside one of the most amazing DTs in crafty blogland - which is such an honour and always so inspiring to me! Pamellia suggested we should all use leftovers from Christmas wrappings, gift boxes and other Christmas bits we all love to hoard. So I decided to join in and use one of the emptied parcels that some of the presents I bought online were shipped in (as I love that particular cardboard)! Christkind (aka DH) brought me some fab Sizzix dies (from the latest Sizzix Sale) and among them was a die that is originally meant to cut parts for a moveable garden fairy that I hadn't seen used anywhere in blogland before. And to be honest I don't like or do garden fairies or fairies at all (although I always see their little houses in the forest on my hikes)...but I immediately saw the potential of that die: it is just perfect for die cutting body parts for jumping jacks in one go. I LOVE jumping jacks and it is so easy to customize the die cut parts (by manually cutting some parts off and/or altering their shapes) so they would fit with my ideas of proportions or head shapes and even get slightly different parts each time! What will you need to make your own Umberto? 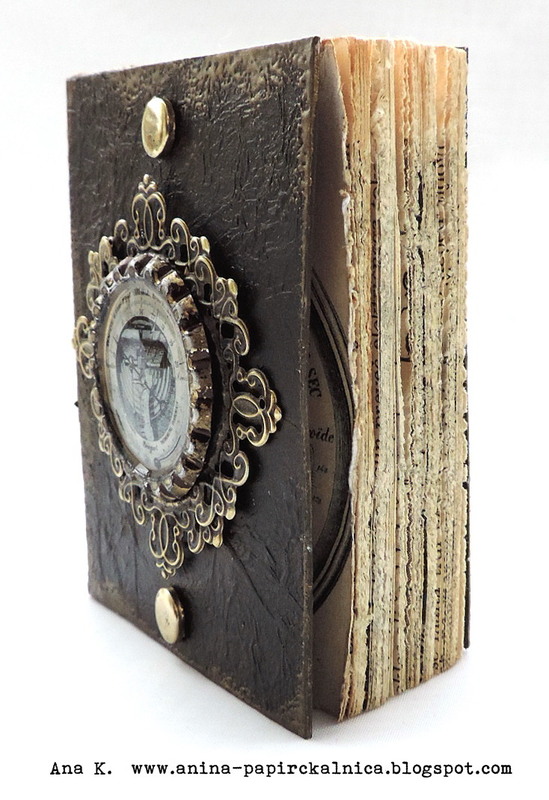 - DecoArt Americana multi surface Metallic "Gold"
- DecoArt Americana Decor Chalky Finish paint "smitten"
First cover a piece of cardboard with some old dictionary paper using the matte or Antique Decou-Page. Let dry. Then cut out the jumping jack parts using scissors or the Sizzix die. Then create a wash of Chalky Finish paint "smitten" (= dilute heavily with water) and paint the parts with it. Lay the dried parts into positon and lightly sketch the outlines of Umberto's swimsuit, the belt, his face and shoes. You can even erase mistakes without damaging the painted surface. I already had an idea of Umberto's face before I cut the fairie's hair off and gave the head a new shape including the ears and hairstyle I wanted Umberto to have. But you can as well do it the other way round and sketch first and then cut off any excess. There's actually no right or wrong when doing his face (as we are not aiming for any naturalistic painting. The quirkier the better!) - so there's no need to be afraid! It also helped me a lot to browse old photographs of that time to get an idea of the funny suits, moustaches and hairstyles back then. So here is the link to my pinterest board where I collect old photographs which I love to use as a reference. Umberto's face was coloured by first painting the hair and moustache (with Charcoal Grey), then painting the white shape of the eyes (with Light Buttermilk) and then using "smitten" chalky finish paint with a drop of Alizarin Crimson to paint the shades of the nose, around the eyes and the ears. The lips were painted using a mix of Alizarin Crimson, a tiny bit of Charcoal Grey and smitten. For the highlights on the nose, chin and forehead I added a tiny bit of Light Buttermilk to the "smitten" and I used Navy Blue for the iris colour. I then painted the upper part of the suit with the Alizarin Crimson and afterwards the pants with the Navy Blue. Once that had dried I added the white belt and stripes with Light Buttermilk. Shoes and socks were painted with Charcoal Grey and Light Buttermilk. For painting the belt buckle I used the multi surface metallic "Gold" and the fine detail brush. To add the reflection to the eyes I used a white Sharpie pen, but you can as well use the small brush and the Light Buttermilk acrylic paint. Make sure you place both white dots slightly out of center and identically - this will make Umberto's looks less "staring". I inserted a piece of thread in both holes (using a threading device) before I fixed the legs to the body. Once all was in place I tied the upper legs together so that the thread was tightened while the legs were in a relaxed (straight downward) position. I then tied a separate thread to the center of the connecting thread (see picture) and tied a small pearl to the lower end for a pulling grip. Next I did the weight that also works as the hanging mechanism. I cut to size a piece of soft but thick wire and gave it a loop right in the centre (using a pair of pliers). Both ends were stuck into two corks and these were painted with Charcoal Grey and set aside to dry. Then it was time to assemble Umberto with the tiny brads and add the hanging mechanism! To fix Umberto's hands to the wire of the weights I used two tiny scraps of tissue paper which I generously dipped into some matte Decou-Page and stuck to the back of his hands and the wire. I hope the image above explains what I mean: the weight of the cardboard hands (and whole Umberto being attached to them) resting on the wire keeps them in place and even gives a little pressure - and the tissue paper scraps fix it all from behind. I left it all to dry this way and didn't move it until I was sure the Decou-Page had dried thoroughly! I then painted the two brads that connect the upper legs to Umberto's body with Navy Blue and dried all with my heat tool (as I tend to be very impatient). I added some rough cord to the wire loop so Umberto can be hung (sorry, Umberto!) in place. Done! See how he's doing his knee bends while still lifting this incredible weight! You shouldn't try move his arms though - as the tissue paper will tear. It is strong enough to hold Umberto in place and to withstand the pulling when he does his knee bends but it won't resist a rotating motion! Hello dear crafters, Ana here and I am so pleased to bring you the first Sponsor Spotlight of 2015! This month we are sponsored by wonderful Nicecrane Designs. 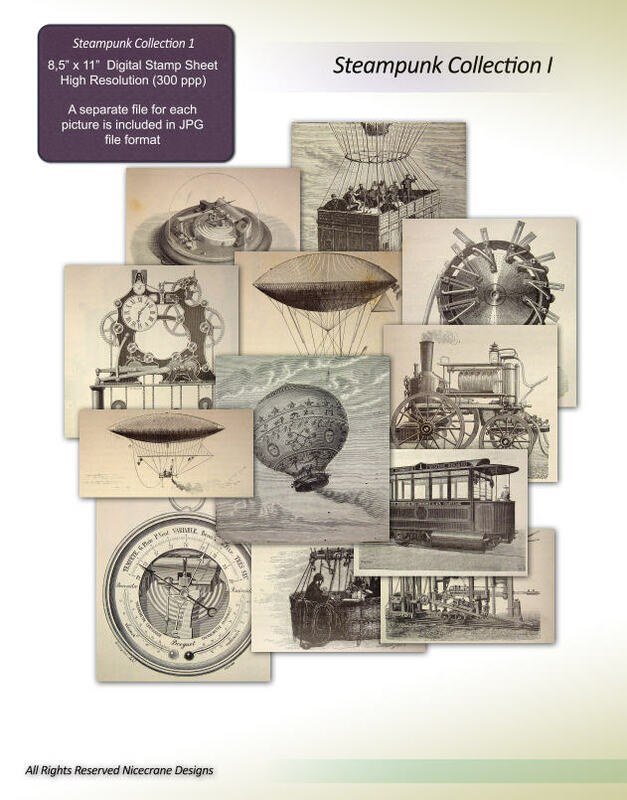 First I printed Nicecrane Designs images in two sizes. I like the barometer image and for me almost look like a clock so I decided that I will use it that way. I took the bigger image and cut the centre out, then I put it on old book and trace around it, so I knew where to cut. I cut the book and applied E6000 glue on one side. Because I wanted the pages to be stuck together well, I used clamps and left everything overnight to dry. I like recycling so I used some old chocolate box and cut 3 pieces, slightly bigger than my pages were. I put it together, left the space between (thicknesses of the cardboard), then attached with masking tape. I attached the crushed tissue paper with Mod Podge and let dry. Then I used dark brown, black and a little bit of gold acrylic paint and paint the covers. 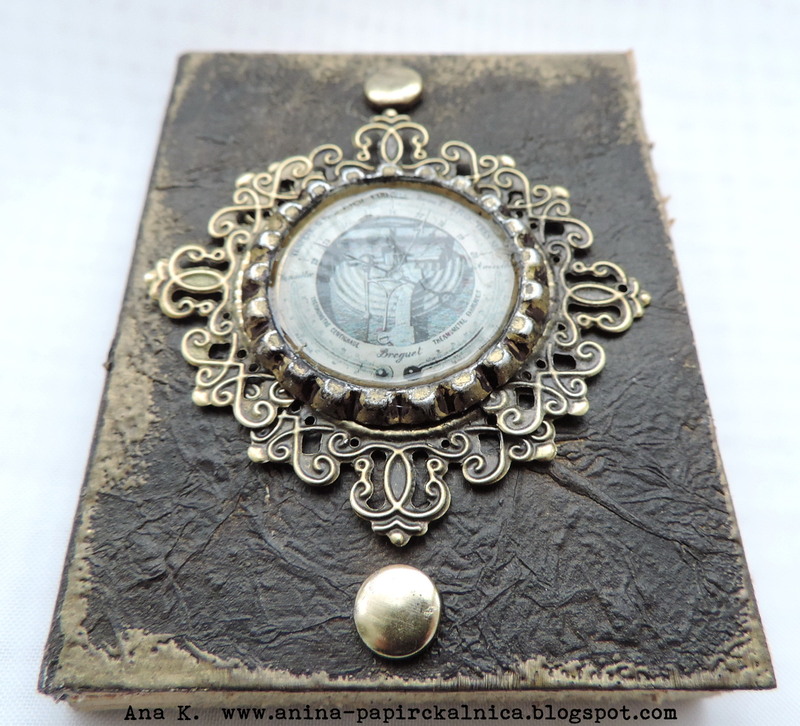 When the paint was dry I used gold embossing powder on the edges and also with stamp on the back side. If you will try to make something similar, don’t worry if your tissue paper will lift up during heating the embossing powder, you can use Mod Podge and seal the covers again. I took bottle cap and place it in my Big Shot (sandwich with one tab and two acrylic plates), so the edges turned outside. My bottle cap had a plastic fill inside, which I melted with heating gun and then remove. I also used black alcohol ink and sand paper, so I reached old, used look. I took two filigrees and cut them on half, then attached them to bottom of bottle cap. I used the centre of smaller barometer image and glued it to the bottle cap, and then everything attached to the front cover. I applied the Glossy Accents on the image and left to dry. My book pages were already glued, so I measured and cut the circles on the pages, then burn the edges. 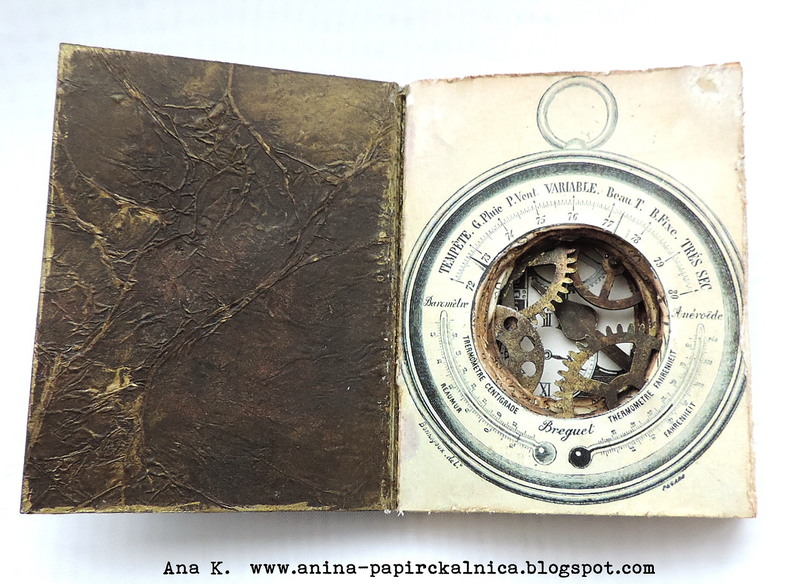 I left few whole pages and there I glued beautiful clock machine image, also purchased at Nicecrane Designs. I used some old gears and distressed them with alcohol inks, then glued the randomly on the circle edges. 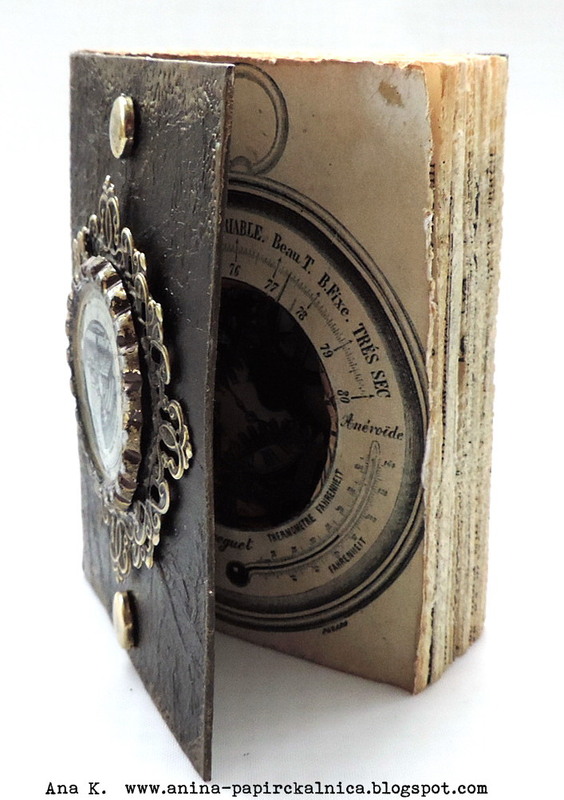 On the first page I glued my focal image – barometer. Would you like to have some great images from Nicecrane Designs? If you like Nicecrane Designs then why not enter our current challenge - one lucky entrant will receive a voucher to spend on Nicecrane images - What a wonderful treat! All you have to do is enter the 'Christmas Leftovers' challenge hosted by Pamellia - Come and share your Festive Leftovers with us!